Thanks to anyone that gave me some guidance while I was searching. I am hoping I did alright with this choice, although I am pretty terrified. 1996 F-250 xlt with 211k original miles, second owner. 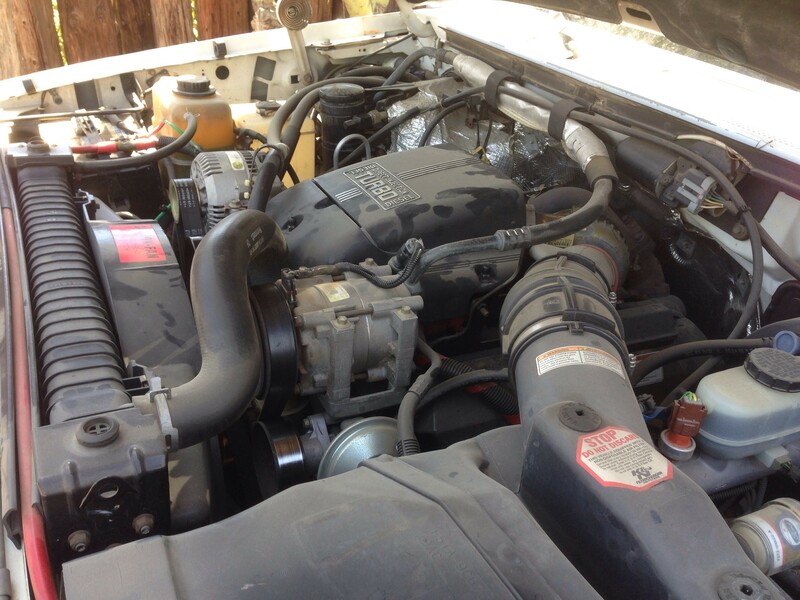 7.3L Powerstroke - She's basically bone stock, which is what I was searching for. 4x4 with auto transmission (was rebuilt at 170k miles, he provided me with receipts. Interior is in pretty good shape as well. Everything seems to work as it should. - small oil leak, need to try and track that down this week. - frame rust? I attached a photo of it to get your guys opinion as well.. looks like its pretty minimal surface rust, but i've never seen frame rust in my life growing up in Phoenix, so it startled me. - Gas pedal takes a little bit of pressure before it actually responds, this may just be that i'm not used to driving a giant truck. I currently drive a 2003 tacoma 4x4. I'm sure i'll get used to it. I've attached some photos. I will take more photos of the interior tonight, but its in really great shape in my opinion. Last edited by DAH7; 08-17-2018 at 03:46 PM. Hi! DAH7 The truck looks clean the rust appears to be only surface not eaten all the way thru which would worry me. Being in Phx. you should be able to find a local body shop that has an out door lift that can spray rust sealer and protector underneath. I had a local shop up here in Flag do that for my old 75 chevy that I restored. Where do you see the oil at? Mule, thanks buddy! The body is a little beat up and you can tell where its been re painted after some fender benders, but the interior is still in great shape and the motor looked very clean and un disturbed. Having the frame sprayed down sounds like a good idea. Mind if I ask how much that cost you? My local shop had charged me an extra $300 to do underside but also, understand that they had done a complete repaint as well as spray in bed liner so, I'm sure they gave me a reduced rate. Yes, that sounds like crank seal but, very unusual I personally have not met anyone that has had to replace that seal even with mine having almost a million miles it is still dry. Best thing would be to clean the area where you think it is coming from and just watch it. The most common leaks on these trucks are down in the valley under your toilet seat a.k.a the black cover or the engine oil cooler which is on the driverside down by the oil pan and it is cylindrical in shape. Just checking have you checked your last post where I left you my name and number in case you wanted to talk about these trucks? I would not worry about the rust on the frame. That is basically cosmetic and trying to do some quick spray on sealer over the rust will only cause problems down the road. Your frame will flex and crack most any paint they put on it, moisture will get under the paint and speed the rusting process. It will take another 40 or more years before the rust become a real issue. Go up North to snow/salt country and they would call that frame "like new". I think you got a great deal on the truck. When you get a chance flush the coolant and fluids if not done recently, that is a much better use of your money. I saw you left me your phone number, thanks for doin that, i'm sure i'll give you a call sometime when I have questions. do these truck need some sort of additive in the coolant to prevent cavitation? I remember reading something along those lines when I was researching various trucks. A coolant flush makes sense, what other fluids would you recommend flushing.. they probably haven't been done in 10 years realistically. thanks man! Yes. Do a search on coolant flush. I would run green coolant and check yearly. Also consider a coolant filter when time and money allows. My trick for finding a leak is to spray down the area with oil eater and wash with hot water from hose if possible. Usually have to do it a few times to figure out how to get it all clean. Once clean check daily with a good light to fine the leak. I have done a front seal, about 6 hours with the right tools if I remember right. I would consider pulling radiator at the same time to make it easier, should be some good u-tube stuff on it. I have heard people mention the term "blow by" alot when talking about diesel motors. I did a quick search and found that one way to test for blow by is to unscrew the oil fill cap all the way and leave it resting in place while the truck idles. So, I did this yesterday after driving home from work, and the cap didn't move a bit. No bouncing around at all, the cap just sat there in place while the truck idled. Did I do this correctly? If so, it sounds like the result was good, correct? When the oil fill cap is removed completely, a very faint smoke comes out. However, I saw a video that showed what it should look like, and mine matched that almost exactly. I am feeling a little les scared about my purchase now! Thanks for the confirmation Mule. Its raining pretty good down here right now, so I wont be able to get out and look at it until tomorrow. I'll snap a photo and post it on here. Another thing that I have noticed after driving it for a couple of days is the gas pedal is a bit strange. For example, when starting off from a complete stop, I have to apply a good bit of pressure to the gas pedal before it starts to react... and sometimes when it does finally get fuel, the RPM's jump a little bit and it takes off kind of quickly... Is this something that is common with these trucks? I don't like to smash on the gas when I drive, and this kind of makes it difficult not to do so.